Hey everyone this is the second article I’ve submitted to 6P. This was the deck that I submitted to J-Wittz’s Double Colorless Competition. While this build utilizes Double Colorless Energies, it pretty much neglects the rest of the cards from HGSS. This is why I look forward to any constructive criticism I can get because I am thinking about maybe using this for States. Thanks for reading! With Double Colorless Energy in the new HeartGold & SoulSilver release, Garchomp SV could be charged up by Turn 2 and doing a possible 120 damage, 140 with Expert Belt attached, to the defending Pokémon. 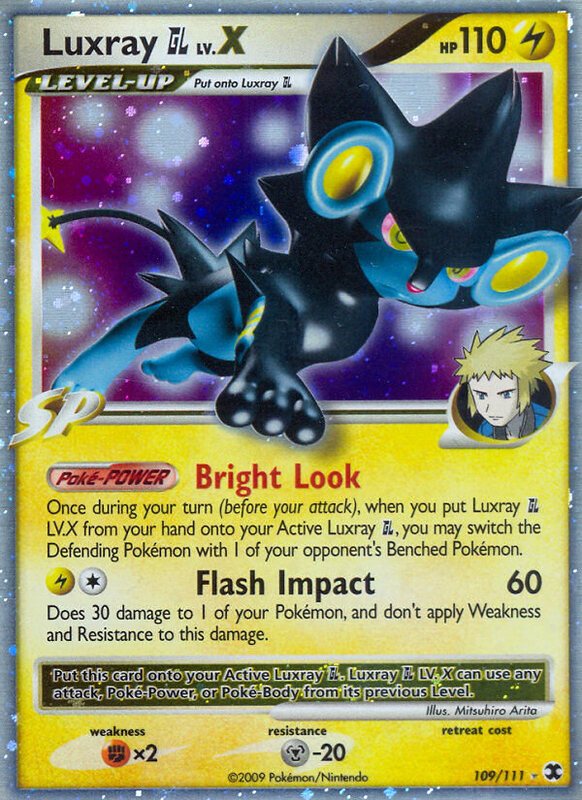 The reason for putting in Luxray GL Lv.X is to pull in your opponent’s Pokémon with its “Bright Look” Poké-Power, which is the very strategy that worked for the last deck that won Worlds in the masters division (Raybees). The idea is to pull in Pokémon that do not have (m)any energies attached for Garchomp to hit big or perhaps to bring in very weak Pokémon so that Garchomp could get away with using “Guard Claw.” However, Luxray can be quite formidable on its own. 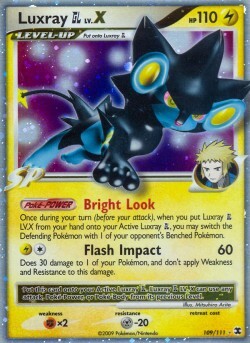 For example it might be nice to throw an Expert Belt, along with two energies, on Luxray so a Claydol is just a “Bright Look” and “Flash Impact” away from turning into a prize card. Chatot can really shine with the introduction of Double Colorless Energy. Now you can use “Chatter” after just one energy drop. Chatter can be nice with all the play Spiritomb has been getting. Barring Warp Energies you could easily control the game by preventing Spiritomb from retreating. Although “Mimic” is the main reason the bird is on the list, which can help dump a bad hand. I chose the Gabite from Mysterious Treasures because it can retrieve those precious Double Colorless Energy cards back from the depths of the discard pile with its “Gather Up” attack. However, Gabite SV is a pretty close runner-up considering it has a free attack that heals all of your Pokémon, and another attack that is very similar to “Chatter” from Chatot MD. This deck is pretty much built around Garchomp SV and its “Speed Impact” attack. It wouldn’t seem right to exclude it from the deck list. I’ll admit Garchomp Lv.X is an unnecessary luxury. It may just seem like just dangling steak for Gengar SF and Flygon Lv.X. However, since it’s a luxury you can exercise some discretion before playing it. The fact that it only adds 10 more HP is somewhat of a buzz kill, but its Poké-Power “Dragon Pulse” could be game-changing. Its attack “Restore” may become necessary late in the game. It could also set up a fallen hero like Garchomp or Luxray GL, or you can get back a discarded Claydol! I’d like to think this list is quite flexible. This could come in handy when you would try to adapt this deck to a local metagame. I chose to leave this list with beefed up lines of Luxray GL and Garchomp so there would be a good consistent starting point. If your area has a lot of decks containing Flygon, Salamence, and Garchomp C to truly fear the colorless weakness (even though it works both ways for those examples), Exploud SV could make a good tech. Its Poké-Body “Erasing Sound” removes the weaknesses from all of your Pokémon. Not to mention that it would be another attacker that could also utilize Double Colorless Energies. 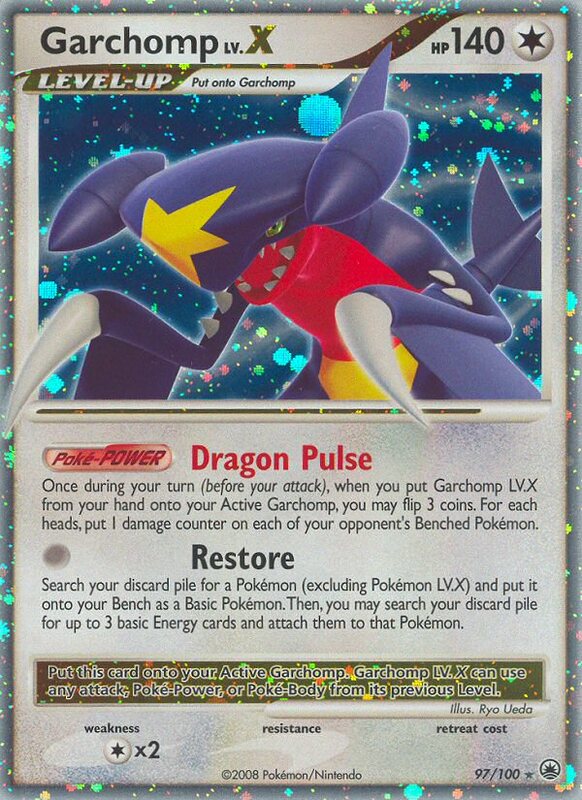 The effect of discarding cards from its attack “Hyper Beam” could setup Garchomp later in the match. Lumineon SF has a Poké-Power “Fin Luster” that can pull a basic Pokémon out of you opponent’s hand and make it active. Excluding a rare scenario, I don’t think there is a basic Pokémon that could survive “Speed Impact” without any energies attached to it. However, since Lumineon must be active to use “Fin Luster” it may be worthwhile to add Warp Energies or more switch cards. for cheaper methods of pulling in Pokémon. I realize they are not quite out yet, but the new Pokémon Reversals do the same thing as “Bright Look” if you get heads. Also you could add four Poké Blower + cards in to better your chances of pulling in a benched treasure. I have to imagine it would be cheaper for everyone to obtain eight trainer cards over a mini-Cyrus engine and two copies of the most expensive Level X out there. As I mentioned earlier the Garchomp Lx.X is a luxury. It may be better to cut it out and beef up the Garchomp line to 4-3-4 since you want to be able to get out your main attacker at all times. Great article, but im not sure this is going to be something i would run for states. It is clever yes but whom is your secondary attacker assuming most people will switch out the luxray for the cheaper trainers? I think Garchomp Lv X benifits decks like Gengar the most, seeing as how it may make everything on the bench one “shadow room” away from KO. But if he is your only attacker i think your going to have to have the lv x in there so as to revive the previous fallen Garchomps. Great article by the way. great article love the concept!! however i wouldnt think it would get run in a major tournament but just as a tester deck! The deck looks pretty good and solid, my only concern is Garchomp Lv.X. The reason? It changes your weakness to x2. Garchomp C Lv.X can now OHKO, and Flygon needs only one evolved Pokémon on the bench to OHKO, 2 if your Chomp X is belt’ed, not to mention that it can simply kill you with the Lv.X’s attack. If you don’t level up, Garchomp C Lv.X fails to OHKO and Flygon needs 4 evolved Pokémon to OHKO, and pretty much cannot OHKO if you’re belt’ed. Seeing how Garchomp Lv.X isn’t helping much (the occasional Restore means you lose a turn of attacking), I’d definitely take it out, maybe for one more Energy Gain or SP Radar. Another great tech would be Dusknoir DP, you Bright Look the weak Pokémon and shuffle their hitter back in the deck. nice dek lamar, I want to play you at league sometime against this dek. Hey, crazy! This is a LOT like the deck I submitted to jwittz DCE contest, except Luxray is used simply for the effect in order to move around benched pokemon for easy KO’s. 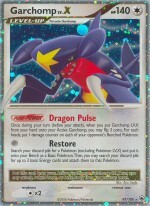 Garchomp SV is definitely a decent card with DCE. The problem for me is that it is so easily countered by sacrificing a prize or two, and stacking energies on one pokemon. For this reason, maybe something like Dusknoir DP would be a good idea like NM2 said. Meh, Luxray OHKOes Shuckle any time. Maxing Warp Point, adding some Cyclone energy, and changing the Luxrays to a small Metagross LA line are all additional ways for the player on a budget to manipulate Speed Impact via switching Pokemon around. The Lv. X can be great at times thought to do a little extra damage or add 10 hp when you need it, its not like you will play flygon or garchomp c every game, plus the beauty of it is you don’t have to level up if its not advantageous. You would have to be a moron to level up only to get OHKO’d because you did. Again Dusknoir DP is wonderful in anything you can fit it in, it’s underplayed and overpowered put it in everything you can. Luxray is the second attacker ‘why it’s in there, and he owns two so he won’t sub them out, he was just offering a cheap alternative for people with limited resources(cash) with the trainers substitutions. With Luxray it seems very viable especially with all the low energy count deck out there, plus don’t forget the energy removing pokebody. This deck could do some damage at states. Hit and run decks like Gengar can’t hide, claydol will never be safe, the over hyped Jumpluff is toast, I like it. Just watch our for turbo dunsparce. seems like a pretty risky counter. 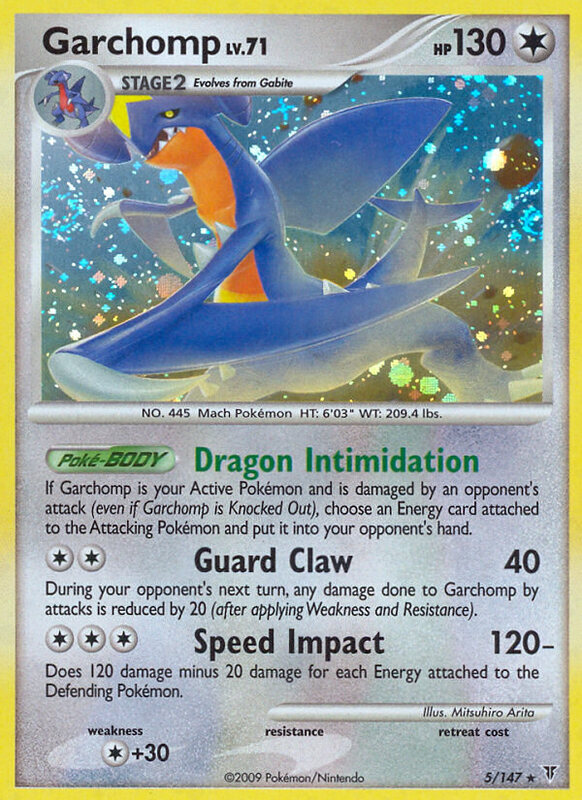 garchomp has guard claw too, and with an expert belt and dce you can do 60 for 1. that’s not a ton of damage, but to me it’s seems pretty risky to attempt to counter in that way. That’s my point. Your only reason to level up are those 0-3 damage counters. Flippy, plus he already runs a Crobat G with 4 Poké Turn for this reason. And right now, both Flygon and Garchomp C are huge parts of the metagame and with DCE’s return they aren’t going anywhere. I’d personally choose not to run it but that’s just me, if you think you’ve got the space, play it, no objections. Trust me, I’ve been playing this since cities, it needs a few better techs (once finished it looks very techy), but once you finish that, not much will make you worry at all. 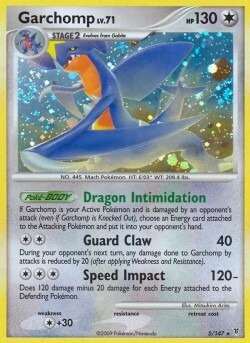 Ive always loved the Garchomp Lv.x and wanted to do some crazy things with it, but then again I have always hated the regular garchomps. This is a good idea, but I think you will find that luxray gl and garchomp will team up for a bout 3 to 4 kills and then the opponent just kills too many garchomps and the game is over. Thats the only thing holding it back. If you really want to get wacky you can add some multi energy in here and put in felicities drawings with gengar sf, machamp sf, or stage 2 pokemon. To discard the stage 2 pokemon and then get them on the bench with energy attached. I doubt it would work great, but its an idea I have always wanted to do. I played against this deck at battle roads and it seemed a little clunky to me then. I think I’d rather play Cyclone, Warp Points, and Regice and then some other backup Pokemon…Jumpluff maybe? That might not be half bad. I tried Machamp in the deck but it doesn’t really aid Garchomp in any way. Dialga G is a problem for Garchomp because they can load up on Energies and your Body gets shut off. You will be doing almost no damage to it. That makes me think a Fire backup might be better. Yeah I ran this with Infernape 4 and fire energies for awhile, frees up a lot of space and gives you a more powerful back-up and constant switching, but your opponent picks. Dewd the multi energy idea with felicity’s and random awesome cards like Machamp and Gengar SF is effing insane, thats the niftiest thing i have heard all day. I don’t know how well it would work but it would be hell to see someone pull that out on you during a match. Can you imagine the look on their face when you bring machamp and gengar to the bench and your opponent had no idea they where included in the deck period. It would be the greatest! I think dusknoir would be an awesome choice for that, save the space from running the line and just run dusknoir and set him on the bench and start shuffling there attackers away in no time. Pure Awesomness! Is a secondary attacker necessary if I go to a 4-3-4 Garchomp line? Beedrill and MaCHAMP decks don’t really have one. Although I would more than likely add Dusknoir DP and Relicanth as techs. If your opponent goes for the T1 Deafen, there’s a good chance they won’t have the Level X in play yet. If “Dragon Intimidation” is not disabled, it will be hard to stack the Special Metals. However, you do have a good point since now Special Metal Energies decrease damage by 30. Thanks J-Wittz! Hopefully the winners will be open with their deck ideas because I’m pretty curious to see what won! Thank you everyone for the feedback! Also congrats to the 5 winners of J-Wittz’s DCE Competition! I actually build this deck awhile back, long before the release of HGSS and DCE. It really never saw the light of day, because it just wasn’t fast enough. I found that running a basic SP with a Stage 2 is something that’s extremely difficult to do well, since they both rely on different support cards. But congratulations on putting together a decent list. wow.. i wonder y no one pays attention to the other garchomp in dp. But nice article nonetheless. A good method to drop fat is following a good fitness routine and a sensible diet strategy. It’s that easy. A good solution to drop weight is following a good fitness routine plus a sensible diet program. It’s that simple. This is really a really excellent read for me, Have to admit you happen to be 1 from the finest bloggers I ever saw.Thanks for posting this informative article. i like your website,i’m benefit from many articles,thank you. Hello. it’s frankly nice and informative article. Thanks for sharing.